The following are diagnostic tests Dr. Radtke and staff use in diagnosing the various diseases and conditions that we treat. The information is provided so that you may become more familiar with a test before you receive it. Because test results will need to be processed and evaluated, it will take 3-5 days before you receive your results. 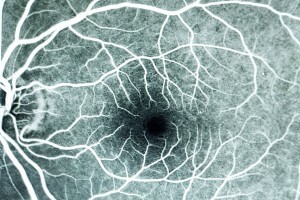 Fluorescein Angiography is a diagnostic test that uses a special camera to take photographs of the retina. A special dye is injected into a vein of either the arm or the hand. The camera takes pictures of this dye as it travels through the blood vessels in the retina. It is not the same dye used in an x-ray angiogram. 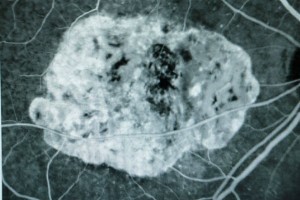 The photographs taken of the retina during this test help determine if the vessels are abnormal. Abnormal blood vessels may leak the dye into the retina or the dye may stain the blood vessels. The dye test may reveal damage to the lining underneath the retina or the growth of new abnormal blood vessels. Dr. Radtke uses fluorescein angiography to help determine the cause and severity of retinal disorders, as well as the options for treatment. Goldmann Visual Field testing is performed in the office by a technician. This diagnostic test is used to detect the presence of abnormal blind spots in both peripheral and central vision. The patient is seated in front of a lighted bowl and asked to push a buzzer when light stimulus is seen coming in from the side of their vision. Size of the light and its brightness are determined by the responses given by the patient. The length of time for this test is based on reaction time and type of test requested by Dr. Radtke. After the test is finished, the doctor will review the test and share the results with the patient. 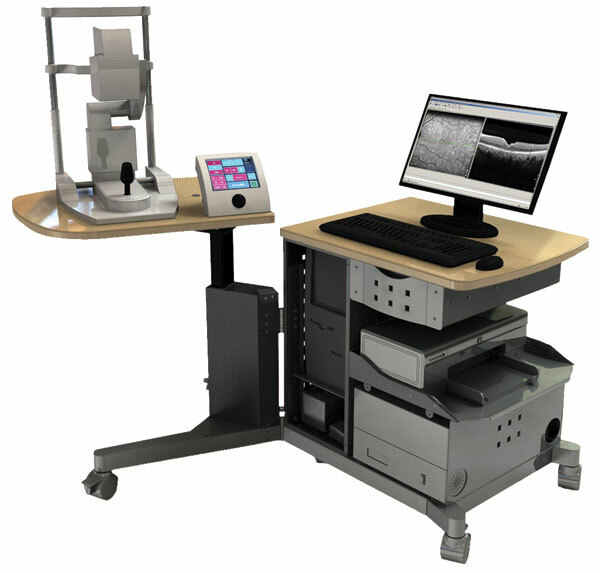 The MP-1 microperimetry is a unique instrument that provides fundus tracking microperimetry with color fundus photography in a single instrument, manufactured by Nidek. The MP-1 microperimetry is a useful adjunct to the diagnosis, treatment, and followup in patients with macular diseases. It is clinically applicable in evaluating scotoma size, both absolute and relative, studying fixation patterns, and monitoring retinal function. It can also be useful in evaluating macular patients, both preoperatively and postoperatively, and assessing the effectiveness of any macular treatment. Our office uses standardized A-Scan and B-Scan to perform ultrasound measurements of the retina and optic nerve. These measurements are used as a supplement to the examination performed by Dr. Radtke. In some cases, the view of the retina is blocked by the presence of blood or opacities in the vitreous. 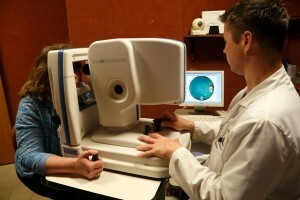 The ultrasound is used in these cases to examine the retina for possible complications of retinal diseases. These complications can include retinal detachment, macular pucker, vitreous hemorrhage, or optic nerve drusen. 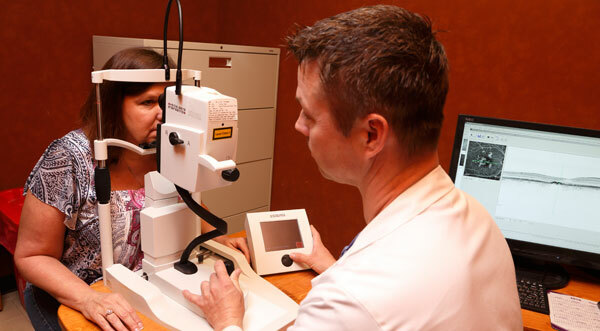 Ultrasound can be used to detect the presence of and measure the size of intraocular tumors such as melanomas. 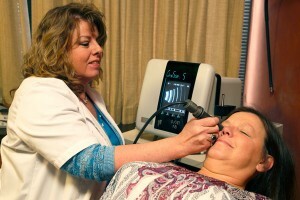 A-Scan ultrasound is also performed to measure the size of a patient’s optic nerve for signs of inflammation. Additionally, in the case of trauma, ultrasound can be used to evaluate any damage to ocular structures and to locate a foreign body inside the eye. Ultrasound is performed by a technician in the office. The patient will be given a topical anesthetic drop to decrease sensation in the front of the eye. 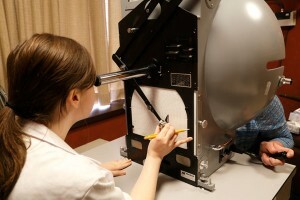 A technician will place a probe against the eye and move the probe to various positions to obtain the needed measurements. After the ultrasound, Dr. Radtke will review the measurements and inform the patient of the results. We use this Heidelberg machine for fluorescein angiograms, OCT, and fundus photos all in one step.